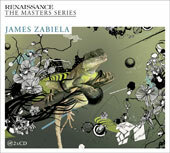 Ahead of the release of his forthcoming Masters Series compilation for Renaissance, James Zabiela presents the first of several travelogue updates leading to the release of the compilation in late February 2009. The first entry can be found by clicking the link above and aslo you can check out an advance 20 minute preview of the first disc of the album. This is the story of my Renaissance Masters mix or, put another way, a few days in the life of me and my music. A random ramble that accompanies the mix should you, the listener, want a further angle into the depths of the music and sounds that can be heard throughout the CD. I spent a month walking around with a microtrak recorder in order to make this CD a snapshot of life through my ears. I practically live in headphones, they´re permanently super glued to my head and I´m not often seen without them, whether it´s going to the shop to buy a pint of milk or flying to some far flung island, city or town for a gig, so the constant use of the microtrak wasn´t a massive change to my outward appearance - lol! This first blog installment describes some of the samples, sounds and tunes that comprise the first 20 minutes of Disc 1, which in an unprecedented move, I am also making avail as a stream (link above) so you can marry words to music and hear what I am talking about. At a later date, before the full release of the album, Im going to offer a free download of all the recorded samples (James Zabiela´s Field Recordings), which you can have fun with picking out of the mix, discovering where and how I used them. As I leave the first track by Michna, I depart Washington DC at the same time; the sound of me getting into a car (03.32) and heading to my next destination can be heard. My friend Joel´s words of wisdom (03.48) ring out like random internal thoughts we sometimes get whilst traveling about from place to place. Tell me I´m not alone here?! On the plane now as Trentemoller´s ´Always Something Better´ comes to an end and the female air steward from British Airways can be heard commanding all electronic devices to be turned off and headsets removed (08.48). As I obey and take off my phones you can hear her words suddenly come into clarity (08.55) but then I mash up her voice with my internal plug-ins (you have to use your imagination whilst listening to this...)! The flight is finally approaching its destination, Milan, which is signaled by a distant Italian voice making a landing announcement (09.06) although its muffled beneath the delays and reverbs going on inside my headphones. Her voice reminds me of the advertisements for the off-world colonies in Bladerunner. Back into a car (09.31), transferring from the airport, speeding down the express way to the sound of Kuriaki, whose synth lines are, in my opinion, fittingly reminiscent of Vangelis. A Hungarian scientist speaks about the possible distance that teleportation allows things to travel (13.30) and at the same time we´re transported musically in tempo and feeling. The way of life can be free and beautiful, now we´re somewhere else these freethinking words aim to provoke as we continue our journey... Taken from the ´Beautiful Place EP´ comes Boards of Canada´s ´Amo Bishop Roden´ (18.32). I actually discovered this track when I was ill once, feeling kind of sorry for myself at 4am, not able to sleep. I hung my head out of the window and rain was pouring onto my face. I´m not saying this is how anyone should listen to it, but I´ll never forget that feeling the track gave me the first time I heard it. Its tortured strings almost sound like they themselves are sick, but the bass notes lift the composition (much like the droplets of rain did on my feverish face). Does that sound too poetic?! We´re back into the film noir of Bladerunner here: Lost in time like tears in the rain´, Roy Batty´s words that come near the end of the film and, sadly, his short lifespan. To capture and reflect this mood I made a field recording of rain from my bedroom window at 4am, which can be heard during the mix transition beneath the two tracks.